Early Years Outdoors Pt. 1 or (Why kids should play out more…). As previously mentioned here, I do a lot of work with younger children, ‘the littleies’ who are at varying stages on the Early Years Foundation Stage (EFYS) curriculum. I wanted to explain why I do this and what I believe the benefits are to the children involved. It begins…. This came about quite by accident. Whilst working for Lancashire Outdoors Education at Whitehough ( a much missed OEC) in 2012, I got the chance to shadow the then teacher on site run a “nursery session”. In short, it was painfully obvious she didn’t really enjoy that element of her work, where as for me with a back ground in early years (in the late 90’s I worked in a school then Day Nursery) I found it fascinating and hugely enjoyable. The reaction of the children to the space to move around in, the way they discovered things, both contrived and naturally occurring was amazing and huge amounts of fun! The giggling and laughter is definitely infectious. So I offered to take the early years work over – and she jumped at the chance to offload it to me. 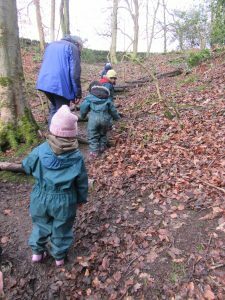 Since then I estimate having worked with several hundred three and four years old’s from,a variety of maintained, private and voluntary sector nurseries across East Lancashire, at various outdoor centres, open spaces and on their own sites (gardens!) from one off type “experiential learning” sessions to regular, progressive sessions, structured as part of that providers broader EYFS curriculum provision. Why? Its about as far removed from climbing or walking up a mountain but it is still huge amounts of FUN. Secondly because I believe it is important. We are repeatedly told by Government and the Media that children and young people are leading more and more sedentary lives and this is contributing directly to the obesity crisis we face. As we can appreciate and some of us will now know, through our own experience or that of family members this obesity thing leads to serious health issues further along in life. What all that means to me is that if I can help foster an enjoyment of the outdoors in children at an early age and expose those children to outside experiences, which many of them simply would not/might not get, than that can only be a good thing. Simple. the simple act of enjoying what stream water feels like on your skin. Why don’t children play out more? This I believe is largely due to the experiences and subsequent fears and prejudices of their parents. It’s difficult to not sound overly judgmental reading that! I am trying to not be judgmental- those people had their outside experiences constrained when they were children and that has gone on to shape their beliefs and values as adults. Some cultures place little value on seemingly “non-academic” activities, despite the well documented value of ‘play’. Parents around the age of 20 to 35 right now are the children whose playing fields were sold off by successive governments in the eighties and nineties for housing (a trend which continues to this day sadly), whose sports days were “non competitive” who were penalised for playing conkers, who became adults at the birth of 24 hour media coverage and are perhaps overly fearful or cautious of the “stranger danger” that is often put out there, despite the fact that it is reckoned that 90% of children who are abused suffer at the hands of someone they know. (NSPCC information). So if children can go home talking positively about their time outside with me and the adventures they have had, perhaps they can open their parents eyes to the possibility of what they as parents could do with their own children in the great outdoors be it garden, yard, park, woods or fell, wherever! If those children begin to see the outdoors as a fun place to be, perhaps they will find the fresh air first before the sofa and tablet/TV or ask to go the park at the weekend. Who knows, maybe even the parents may benefit too! From a health perspective, at the age of three and four children are putting the ground work in and developing their agility, balance and co-ordination – all vital in staying fit and being able to work and play throughout life. The gross motor movements of children at this age directly contribute to developing the strength and control needed for those fine motor movements we still value in society – like writing or using cutlery. We have barely scratched the surface on physical health but mental health also benefits from time outdoors. With studies reporting improved mood, memory, mental energy after time outside to people being prescribed “walks in the country” to help combat depression and stress, anything we as adults can do to instill a love of being outdoors in our children can only be a positive thing and be a beginning of equipping them with the tools to manage what life is going to put in front of them. 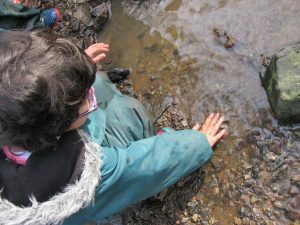 In the next part I will tie the “outdoors” into the EYFS and how this contributes to each child making steps of progress inline with the development outcomes for their age.